A prominent Pakistani social worker, Abdus Sattar Edhi, says he is stranded in New York because US immigration officials have taken his passport. 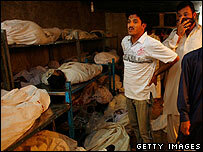 Mr Edhi runs the largest social welfare network in Pakistan, and has offices in several countries, including the US. Officials interrogated him for over eight hours at JFK airport on 9 January and then took his passport, he says. Mr Edhi told the BBC that while he was allowed to enter the US, the passport has still not been returned to him. "I am a man of emergencies, I need to be on the move, to be where the suffering is, but here I have been sitting idle for 20 days because I cannot travel without my passport," he told the BBC from New York. 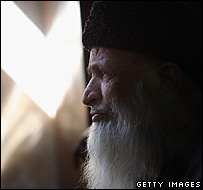 His Edhi Welfare Trust runs hundreds of ambulances, a helicopter ambulance, as well as homes for children, women, the mentally ill and drug addicts. It has run relief operations in Africa, the Middle East, the Caucasus region, eastern Europe and even the US, when it helped provide aid following the New Orleans hurricane of 2005. Mr Edhi said that officials of the Pakistani embassy and the US state department are helping him to recover his confiscated passport. "During the interrogation, they wanted to know why I travelled to the US so frequently," he said. "I told them about the nature of my work, but they did not understand. They also wanted to know why I was not living in the US in spite of having a green card." This is not the first time that Mr Edhi has run into trouble with immigration officials abroad. In 2006, he was detained for 16 hours at an airport in Toronto, Canada, and had to miss his flight. In 2007, he was again detained for eight hours at an airport in New York. On both occasions, his travel documents were not confiscated and he was allowed to proceed after interrogation. In the early 1980s, he was arrested by Israeli troops while entering Lebanon to deliver aid to Palestinian refugees whose camps were attacked by the Israeli jets. He was freed when his credentials were verified. "The only explanation I can think of is my beard and my dress," he said when asked why he had been stopped so often. Once branded as a "communist" by his detractors because of his liberal views and his welfare activities, the 78-year-old sports a flowing beard and dresses strictly in Pakistani shalwar-kameez and a sheepskin skullcap.